It allows you use Sony Minolta AF MA lenses on Sony NEX E mount camera. 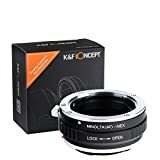 • The K&F Concept Minolta(AF) Lens to Sony NEX Lens Camera Mount Adapter allows you to place your favorite Minolta lens on your Sony NEX camera body. • High quality and compact. Made of brass and aluminium(not plastic). 100% Brand New. • If your camera indicated “lens is not properly installed”, please modify the camera menu settings. this adapter ring could be attached to your lens but you could not adjust the aperture. This entry was posted in Discount Photography and tagged Adapter, Camera, Concept, lens, MinoltaAF, Mount, Sony by Ball Photo. Bookmark the permalink.